18 LISTS Getting in the Spooky SpiritHalloween is here! How will you celebrate? List Rules Vote up the craft projects that provide the most spooky fun with the least effort. The Halloween season provides plenty of opportunity to put your creativity and artistry into practice, but if you don't consider yourself particularly creative or artistic, don't worry; these easy Halloween crafts make a big impression. Whether you plan to hold an All Hallows' Eve bash, go trick-or-treating with the kids, or simply have a quiet night in, Halloween party decorations you can make yourself are always in style. These projects don't demand much crafty prowess. All you need to create the perfect DIY Halloween decorations is a little outside-the-box thinking and some elbow grease. Though stores are overrun with decorations this time of year, store-bought items are often impersonal and lack a sense of connection to your family and your home. Fortunately, there is no shortage of easy things to make for Halloween. There's no need to run out to the craft store to purchase specialty equipment you'll only use once or exotic supplies that you don't know what to do with. Gather some cheesecloth, glowsticks, a black marker, string, and balloons, and you've got what it takes to craft these one-of-a-kind Halloween lawn ornaments. According to YouTuber BeforeAndAfterTV, you can design these to be as scary or sweet as you want, making them ideal for kids (and adults) of all ages. 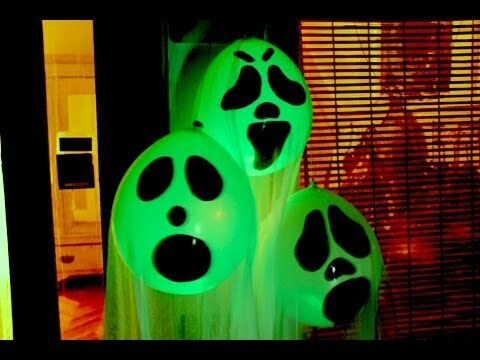 Given the short lifespan of glowsticks, this is a great project to save for the day of your Halloween festivities. Is this an easy, spooky Halloween craft? There's no reason all the fairies, nymphs, and woodland sprites can't come out on Halloween, too. These fairy glow jars don't require much in the way of supplies (Mason jars, glow-in-the-dark paint, small paintbrushes) or artistic ability. Thanks to YouTube user Nava Hannah you can now create the perfect complement to your pumpkins on the front porch or unique decor to put on the windowsill of a darkened room. 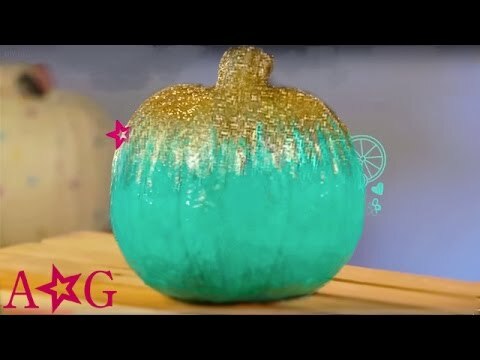 Another excellent option for those who dread traditional pumpkin carving are these glittery pumpkins that can be thrown together in a matter of minutes. Plus, who wouldn't want a pumpkin that resembles a drag queen? Also, American Girl put together the above tutorial with the help of a child, so, really, there should be no excuse for not being able to pull this one off. What would Halloween be if the grownups couldn't enjoy their favorite adult beverages? These Halloween ice buckets are shockingly easy to throw together. Find a large pumpkin and a slightly smaller bowl that can sit snugly inside, and pick up some dry ice to make it extra creepy; that's about all it takes to create an ice bucket your guests will never forget.